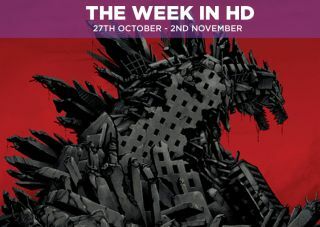 The Week in HD – Monday 27th October | What Hi-Fi? The King of Monsters stomps into Hollywood for a second time, and this time it's not utterly embarrassing. The story is thinner than a Japanese door, but it's well worth watching for the suspense and drip-fed violence. Especially if you're lucky enough to have a home cinema - because it sounds astonishing. Also, if you liked this (or even if you didn't), director Gareth Edwards's first film Monsters is a beautiful take on the monster genre. Fans of Aaron Sorkin may be disappointed to learn that The Newsroom's third series will be its last, but the Blu-ray release of its second series should soften the blow somewhat until the end. The show tackles the behind the scenes drama of fictional Atlantic Cable News, following Jeff Daniels's news anchor and his team as they cover breaking news around the world. The second series is set during the United States Presidential campaign, leading up to the Election Night of 2012. As always, Sorkin's dialogue is bitingly policital and whip-smart, while impassioned speeches give the show and its characters heart. The Balloonman. Detectives Gordon and Bullock are on the case of a man who ties corrupt public figures to weather balloons, so they float away and fall to their demise for all of Gotham to see. As it sows the seed of vigilantism in a young Bruce Wayne's mind, Fish Mooney takes more steps to overthrow crime boss Falcone. Meanwhile, Oswald Cobblepot returns home, gets a menial job in a restaurant, catches the attention of rival boss Sal Maroni and shows off his knife skills. Four Walls and a Roof. Rick & co find themselves pitted against a very nasty group of people, and must hatch a cunning plan to come out victorious by the end of the episode. And not zombiefied, of course. The newest comic book hero to take to our screens is The Flash (played by Grant Gustin) - first glimpsed in Arrow's last series. We meet Barry Allen - an orphaned forensic investigator who's obsessed with cold cases and paranormal occurrences to the point where he'd be best friends with Fox Mulder. The cause? His mother's strange death, which he claims was due to a ball of lightning with the face of a man, not his father who's been wrongly accused of the murder. Of course, there is the event of being struck by lightning during a city-wide radiation surge and then being doused in lab chemicals that leads him to develop superhuman speed. Barry then uses his newfound 'metahuman' power and CSI skills to track down other, more criminal metahumans causing chaos in Central City. A Place in Space and Time. Brian Cox explores our place in the universe, how we're just a tiny speck of rock in a space that's infinitely huge, really really old, and more full of wonders than we can possibly fathom. But we used to think that we were the centre of the universe. As the professor tracks the stars in the night sky from the Atlas Mountains in Morocco, to crediting the glass-blowers of Venice for the telescope Galileo would use to make his discoveries, we're confronted with exactly what our place in the universe is. Massacres and Matinees. The deliciously bizarre horror anthology is back, with the fourth series taking place in the small town of Jupiter, Florida in 1952. The show follows one of the last 'freak show' troupes of the American carnival tradition, complete with bearded lady, conjoined twins, a three-legged contortionist and the world's smallest woman. Michael Chiklis joins as the strongman in tonight's episode, as a citywide curfew threatens the Freak Show's existence. Root Of All Evil. With a poster that looks like Game of Thrones crossed with the Nazguls from The Lord of the Rings, the sleepy town of Sleepy Hollow is about get hit by some apocalyptic forces. But first, we're back the to mystery-of-the-week formula as Abbie and Ichabod hunt for a silver coin after a violent bank robbery. Online Video Channel. Tonight's task: Create a YouTube channel, become a viral hit. Sounds easy, no? Of course not. One team goes for cookery comedy, while the other goes for fitness in hopes of getting the most clicks. Get ready for facepalms and cringeworthy moments as these business-minded people take on the internet. That '70s Show. When a mobster's body is found on a construction site, the detectives have a chance to solve a decades-old mystery. But the only witness to the crime is a man who believes he still lives in the 1970s. The next logical step is of course to dress up in full '70s costume to solve the case. It's silly and ridiculous, but it's these kinds of episodes where the Castle cast and fans have the most fun. Starling City is revelling in a spell of low crime rate as series three starts, but it doesn't mean Oliver should stop being vigilant. We've been promised a crossover special with new series The Flash in a couple of episodes, too. Things take a nasty turn for the Shelbys as their London base is destroyed, allegiances are shifted and family troubles threaten to tear them apart. It takes all of Tommy's wits to try to gain the upper hand again, but he's understandably distracted when an old friend reappears. Growing Up. After last week's traumatic episode that showed horrific events happening to adorable, fluffy baby animals as they try to survive, we wonder what horrors David Attenborough has in store for us this week. Now in their teens, we assume they want to do nothing more than stay indoors and listen to loud music. Instead, they have to hunt and fight for food and survival. Again. Heavy is the Head. As Carl Creel tries to return the obelisk to Hydra without dying, Lance Hunter is approached by General Talbot to sell out Coulson and the rest of S.H.I.E.L.D. for a big fat paycheck. Considering his entire team was murdered last episode, the mercenary is understandably tempted. Let's hope he doesn't, because we rather like all the new additions to the S.H.I.E.L.D. family. Guest host Damian Lewis presides over panellists Roisin Conaty, Andy Hamilton, Ian Hislop and Paul Merton as they discuss and dissect the week's news with the usual satirical rigour. Remember that 2010 film called Legion? The one with Paul Bettany as archangel Michael who comes to Earth to protect a young woman named Charlie and her unborn child to stop angels from destroying mankind? Yeah, that spawned a spin-off TV show. Set 25 years after the film, the pilot focuses on Vega (formerly Las Vegas) - one of the few fortified cities that survived the angelic onslaught. Michael is helping the humans fight against Gabriel (who still wants to destroy all of mankind), while Charlie's son is now all grown up and is the rumoured 'Chosen One' that will end the war. That all sounds like a good thing, except there are some in Vega (politicians, televangelists, etc) that believe their hierarchy and belief system is threatened by Charlie's saviour status. And so, the war continues. Lenses. And lungs, legs and other parts of the body beginning with L. Guests tonight include Jo Brand, Josh Widdicombe and Phill Jupitus. After a surprise victory against Tottenham Hotspur, Newcastle United are starting to relieve some of the pressure on manager Alan Pardew - but there's no respite as Liverpool come to town, with Reds boss Brendan Rodgers still yet to see his side reach the same heights as last season. In most seasons, this would be one of the Bundesliga's marquee fixtures. But something is amiss at Dortmund this season, who have lost six out of the first nine and sit a point above the relegation play-off spot. Could that be in part down to striker Robert Lewandowski's departure at the end of last season? Or is it just coincidence that his new club, Bayern Munich, are already four points clear at the top? Dark Water. "Death is not an end." Chilling words indeed from a new secret organisation called 3W (which, to be honest, sounds like a new network service) as we enter series finale territory tonight. In tonight's part one, we plunge deep into the Nethersphere as the Doctor finally comes face to face with Missy. But what are her secrets, why is she monitoring him and Clara, and what role will the Cybermen play in her dastardly plans? One of the best Halloween films of our generation. Scream poked fun at all the horror movie tropes with wit, humour and self-referential pop culture nods and still managed to give jump-in-your-chair scares. And Ghostface is still entertaining and chilling while stumbling over his costume to get at you. The first half of Sky's Super Sunday comes live from the City of Manchester Stadium, where reigning champions City have stuttered in the start of their defence of the title this season, already six points behind pacesetters Chelsea. Meanwhile, United's draw at home to Chelsea might just suggest that the van Gaal era is starting to bed in at Old Trafford. And what better way to put that to the test than a fierce derby? The United States Grand Prix. As the action heads to Austin, Texas, we're going to be two teams short of our usual 11. Marussia and Caterham have been forced to withdraw from the US GP, which leaves just 18 drivers on the track. In more exciting news, Mercedes has already wrapped up the Constructor's Championship, which means Lewis Hamilton and Nico Rosberg are free to race for glory. It wouldn't be Halloween without Tim Burton and his colourful and twisted Gothic world. When a recently deceased couple find their house has new living inhabitants, they call upon the obnoxious and demented Beetlejuice to get rid of them. With Michael Keaton, Alec Baldwin, Geena Davis, Catherine O'Hara and Winona Ryder, this is Tim Burton at his most comically macabre and delightfully gruesome best. Writers Joss Whedon and Drew Goddard take the 'five friends go on a holiday to a remote cabin in the woods and then the usual horror-murder happens' trope and turns it on its heads. It's a fresh, inventive take on teen horror films, one like no one's done since the Scream films. There are laughs, there are genuine scares, and there are moments so gory and horrific and just plain awesome that we can't help but love this gem of a film. That elevator scene, though. That's ace.